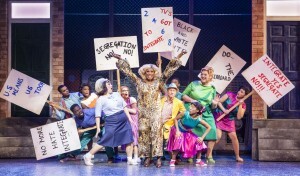 DAREDEVIL, children’s TV legend, chief Scout and an erstwhile colleague of Anthony Hopkins, Maggie Smith and Derek Jacobi… and now Wilbur Turnblad in stage musical Hairspray. Peter Duncan’s career has been nothing if not varied, and he’s only too happy to be helping tell the tale of Tracy Turnblad: a big girl with big hair and an even bigger heart. The story is set in 1962 Baltimore, where Tracy is on a mission to follow her dreams and dance her way on to national TV. Tracy’s audition makes her a local star and soon she is using her new-found fame to fight for equality, bagging heartthrob Link Larkin along the way. “Hairspray is a great musical and I get to sing and dance and make people laugh – what more could you ask for?” says Peter. “This show is based on the original 1988 film version directed by John Waters. I’m not particularly a fan of his but it’s interesting to see the roots of the story and where the whole thing comes from. It’s all a world away from his early days on stage as a teenager at the National Theatre alongside the likes of Hopkins and Jacobi. “I knew they were obviously quite good at what they did but, at 16 or 17 years of age, I didn’t really register they were important,” he says now. Of course Peter is best known for his two stints as a presenter of children’s TV show Blue Peter, where he took on the daredevil role vacated by John Noakes, later leading to his own series Duncan Dares. “It always comes up,” laughs Peter. “It’s the same for Janet Ellis – she’s a novelist now but it’s always ‘former Blue Peter presenter Janet Ellis’. But I loved doing it so, although it was actually a small part of my life, I don’t mind.” It doesn’t sound like he’s likely to return to TV any time soon though. Having been nominated for an Olivier Award for his role in The Card, Peter says: “I love doing theatre… there’s not much on TV I’d want to do now. It’s either reality stuff or kind of one-dimensional drama. TV seems to be all about wanting to become a superstar or staid stuff like Downton Abbey. “I prefer the Scandinavian dramas. I’m watching an Icelandic one called Trapped at the moment. There just seem to be more layers to it. I watched the first episode of The Night Manager and it’s quite enjoyable but it’s like a comedy James Bond. He says he has no plans to join any of the current crop of reality TV shows, although he adds: “I did Tumble last year, which was a kind of gymnastic circus show. In a way, Peter helped pioneer reality TV, with three travel series programmes – he did three travel documentaries between 1999 and 2005 in which he, his wife Annie and their four children – Arthur, Lucy, Katie and Georgia – were filmed travelling around the world. Peter says the travel bug has stayed with him and, outside of his theatre commitments, he has recently helped set up the Natural Adventure Company organising self-guided walking trips in destinations, such as Albania, Bulgaria, Montenegro and Kosovo. Peter’s latest expedition brings him to Woking’s New Victoria Theatre stage in Hairspray from Tuesday 15 March until Saturday 19 March.